CAPTIVATING - The epitome of opulence this ladies necklace could easily be mistaken for a precious piece adorned with a \'girl\'s best friend\' for a look that is timeless and elegant. EYE CATCHING SPARKLE - AAA round flawless cubic zirconia stone held in a unique setting with another smaller stone, for a look that will sparkle from every angle. NO SKIN TARNISH... or discolouration. Extra thick 14k White Gold plating over environment friendly brass that will stay shiny for years to come. Chain length 38cm plus 5cm extension chain. Secure easy lobster clasp. A PERFECT GIFT... packaged in an opulent drawstring bag. 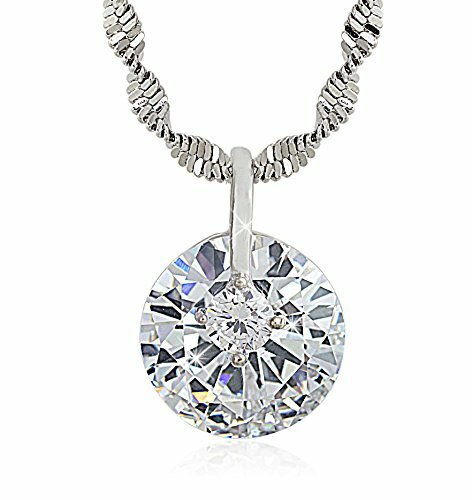 This beautiful cz necklace also makes a memorable choice for Birthdays, Anniversaries, Easter and anytime you want to surprise a special girl. EXTRA SPECIAL - it\'s vivid brilliance will really make a statement and these stones are much more hardwearing than Swarovski Crystals. Ideal present for those special Girlfriends, Moms, Daughters and Granddaughters.